LADATEK, LLC is the premier provider of data warehousing, business intelligence and web-based application solutions. We also offer management consulting and project management services. Whether you have a need a web site, an applicaton or database solution, we can help. We also provide our expertise in the areas of business analysis (BA), project management (PM), quality assurance (QA), business process management (BPM) and risk management. We work with clients in the Chicago area as well as from other states. 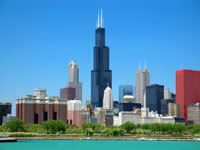 Chicago in a great transportation hub and allows us to travel to client locations easily. We strongly believe that technology is simply a means to an end and always focus on the goals and objectives of our customers. Only with complete understanding of the business need, we suggest the most appropriate and cost-effective solution. We know how to deliver results on time and on budget. Our project management is based on the time-tested methodologies from Project Management Institute (PMI). We are looking to build long-term productive relationships with our clients. Short-term projects typically end up being more expensive and are usually rather stressfull for the client's IT department. As we learn about your business, we become more productive and effective and can offer better solutions for your needs. We are truly looking to become your RELIABLE partner!